We would like to thank Sister Superior Maria Ligaya of the Adoration Convent of Divine Mercy of Tagaytay for including and remembering our family in prayer before the Most Blessed Sacrament by the Holy Spirit Adoration Sisters. We attended a Sunday at Divine Mercy Convent at the Holy Spirit Drive in Maitim 2nd East with Nannie’s niece Tess Elazegui and husband Noel and their two sons of Calamba City during our visit to Manila last December. The Divine Mercy Convent in rustic Tagaytay is a 30-minute drive from Calamba. Divine Mercy devotees from as far as Manila, Quezon City, Marikina and neighboring cities and town in Cavite and Batangas attend Sunday masses and holy days of obligation at the Convent. The Convent has an electronic bell that rings during the various rituals of the mass. Abe and Pe Buco of Long Beach returned March 2 after a one-month vacation in the Philippines. The Bucos visited friends and relatives in Hagonony, Bulacan, Arayat and Candaba, Pampanga, Marikina City, Quezon City and Manila. Tony and Bong Bernardo, our website designer, tendered a despedida party for Elaine Pasaba, Bong’s aunt, last March 11 at their residence in Chula Vista. Elaine left for Manila the following evening after a six-month vacation in the US. She was a houseguest of the Bernardos during her stay in the US. Meanwhile, Tony’s parents are vacationing in California in April. 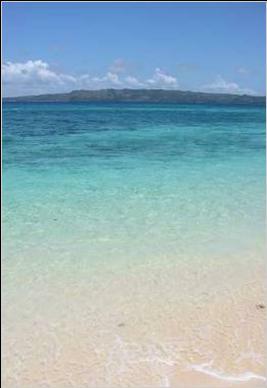 The fabled White Beach in Barangay Balabag is Boracay’s signature beach attraction for local and foreign tourists. It is well-known for its powdery white sand and clear blue waters as seen in the picture. THOSE WHO have been to this tiny dumbbell-shaped island in the Western Visayas described Boracay in many fluttering and superlative phrases, which of course, it richly deserves. Travel writers and world travelers who visited the island are all in one in saying Boracay is truly “an island paradise.” Sun lovers and worshippers from Europe, America, Asia and other parts of the world flock to Boracay and keep coming frolicking in the sun on its powdery white beaches from sunrise to sunset. Boracay was voted twice as “the most beautiful resort island in the world” by travel writers and tourism editors. The Sun Herald of Australia and Harper’s magazine chose Boracay as “the best tropical beach in the world and the perfect island getaway with its warm blue waters, powder-fine white sand and a palm-fringed 4-kilometer beach.” The BMW Tropical Beach Handbook and the British Publication TV Quick in its issue of December 21, 1996 rated Boracay one of the top tropical beaches in the world. The Taal Lake as seen from the Tagaytay Ridge on the viewing deck of Taal Vista Lodge. 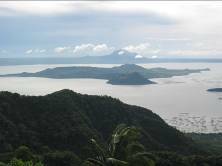 The small island in the lake is the world-famous and active Taal Volcano. Tourists and visitors who want to get a close look of Taal Volcano are ferried by small boats or bancas. Kumusta! Is bimonthly family newsletter published by the Labrador Creative Group of Van Nuys California, USA and distributed to friends and family members in the US and the Philippines. Kumusta is a Filipino word meaning “hello” or “how are you”. It is the Filipino way of greeting friends, relatives and strangers. Comments/opinions are welcome and may be emailed to alabrador@sbcglobal.net. A balik-lakbay to the Philippines is incomplete without visiting the town of Pagsanjan in Laguna and shooting the rapids of Pagsanjan Falls.